ABBOTT PARK, Ill., March 6, 2018 – Abbott today announced the U.S. Food and Drug Administration (FDA) approved the Masters HP™ 15mm rotatable mechanical heart valve, the world’s smallest mechanical heart valve, that will allow doctors to treat babies and toddlers in need of a mitral or aortic valve replacement. Until today, surgeons could only use a range of larger-sized valves to replace a pediatric heart valve that could not be repaired, and larger valves are often not suitable given the smaller size of children’s hearts. This dime-sized new valve is the first and only pediatric mechanical heart valve developed for newborns and infants, and offers hope for pediatric patients in urgent need of treatment who have no other approved options. 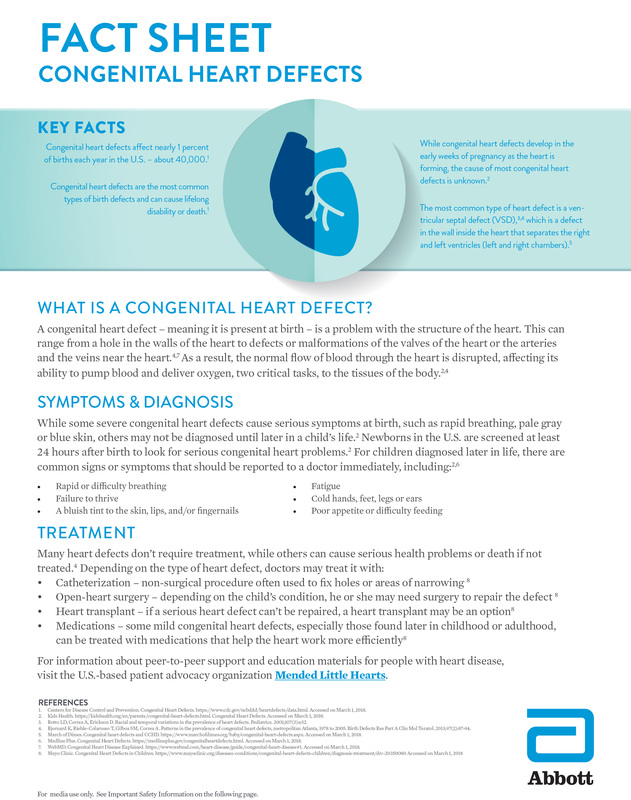 In the U.S. alone, congenital heart defects (CHD) affect nearly 1 percent – about 40,000 – births each year.1 For children who have a poorly functioning valve that cannot be repaired, a valve replacement procedure using Abbott’s 15mm mechanical heart valve is now an option. Sadie Rutenberg, now a 3-year-old, was only a few months old when her parents noticed she was breathing fast, stopped gaining weight and was not eating well due to a congenital heart problem. When the tissues of the heart valve have a significant malformation or are too damaged and cannot be repaired to function properly, it may be necessary to replace the valve with a mechanical valve. A mechanical heart valve mimics the valve of a healthy heart, opening and closing with each heartbeat, permitting proper blood flow through the heart. 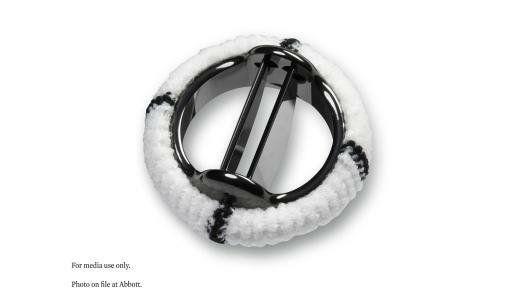 The approval of Abbott’s new Masters HP™ 15mm rotatable mechanical heart valve was primarily based on the results of a clinical trial, which enrolled pediatric patients five years of age or younger who had a diseased, damaged or malfunctioning heart valve. 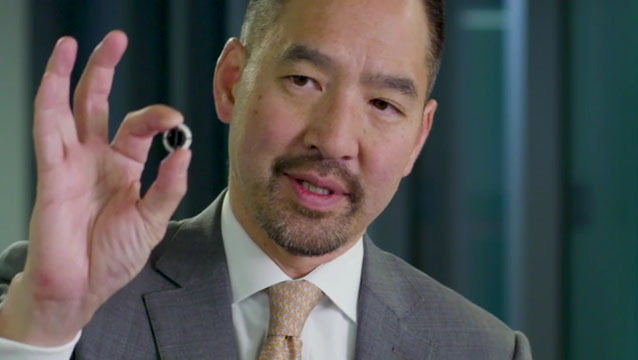 Jonathan M. Chen M.D., co-director of the Seattle Children’s Hospital Heart Center and division chief for pediatric cardiothoracic surgery, was the first physician in the trial to implant the Masters HP 15mm valve in a pediatric patient. Dr. Chen treated Sadie Rutenberg, who was the first infant to undergo the treatment in the clinical trial. She is now a healthy 3-year-old. 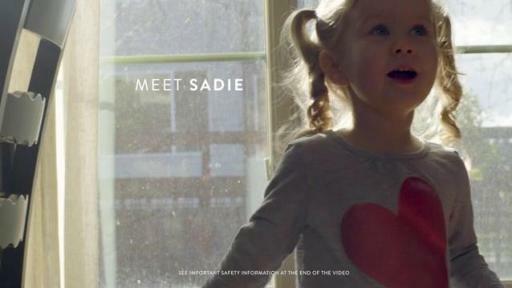 Click here for more details on Sadie's story. 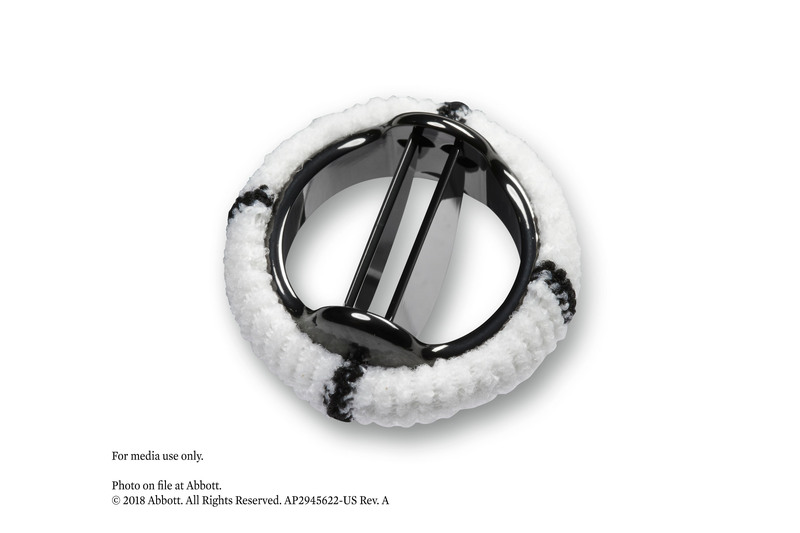 The Masters HP™ 15mm rotatable mechanical heart valve is a rotatable, bileaflet mechanical heart valve designed for implantation in the mitral or aortic position and is part of the Masters Series line, which now includes seven valves with diameter sizes ranging from 15 to 27mm. Initially approved in 1995, the valves have pyrolytic carbon leaflets and orifice rings, an 85-degree leaflet opening angle to improve flow and reduce turbulence, and a controlled torque rotation mechanism for rotation and intraoperative adjustment. A sewing cuff contains additional suture markers for more accurate placement. For U.S. Important Safety Information on the Masters HP Series, visit http://abbo.tt/2taeyVL. At Abbott, we’re committed to helping people live their best possible life through the power of health. For more than 125 years, we’ve brought new products and technologies to the world -- in nutrition, diagnostics, medical devices and branded generic pharmaceuticals -- that create more possibilities for more people at all stages of life. Today, 99,000 of us are working to help people live not just longer, but better, in the more than 150 countries we serve. 1 Centers for Disease Control and Prevention. 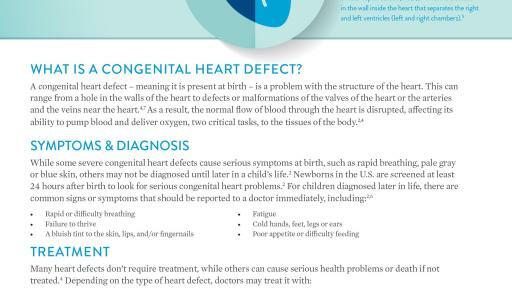 Congenital Heart Defects. Available https://www.cdc.gov/ncbddd/heartdefects/data.html. Accessed on January 26, 2018. 2 Healthline Medical Team. Available at https://www.healthline.com/human-body-maps/mitral-valve. Accessed January 26, 2018. 3 The Society of Thoracic Surgeons. Mitral Valve Disease. 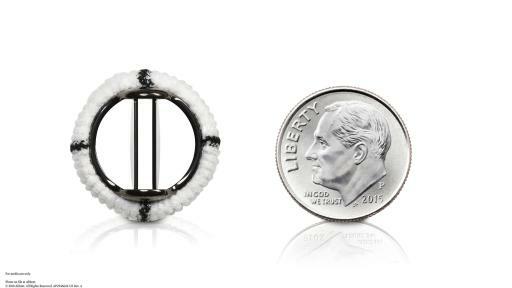 Available at https://ctsurgerypatients.org/adult-heart-disease/mitral-valve-disease. Accessed January 26, 2018. 4 Healthline. 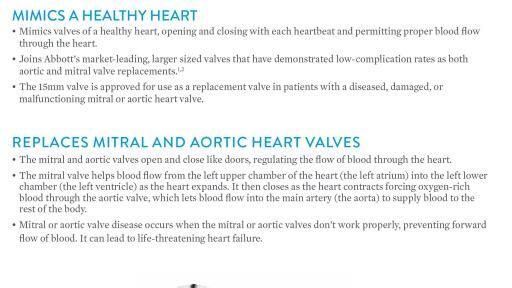 What is mitral valve disease? 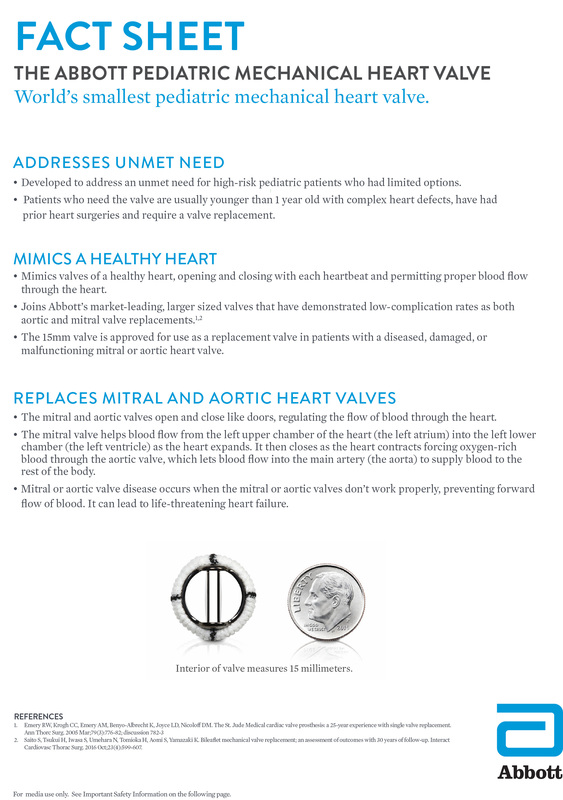 Available at https://www.healthline.com/health/mitral-valve-disease#overview1. Accessed January 26, 2018.